Peter Benjamin Mandelson, Lord Mandelson, a British Politician and a former European Union (EU) Trade Commissioner, was rushed to hospital with kidney complaints and subsequently diagnosed with having kidney stones, said the British media. Nothing to it: White, clean and full of protein (!) 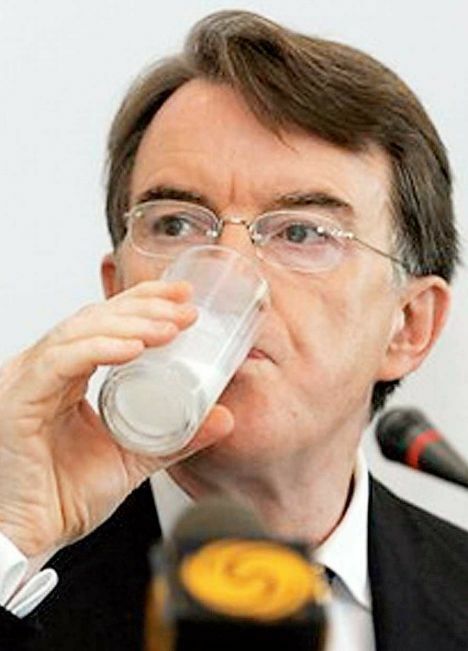 Peter Mandelson Drinking the local milk during a televised press conference in China. In an otherwise carefully calculated political stunt, Lord Mandelson in his former role as an EU Trade Commissioner gulped a glass of Chinese milk on television during a press conference on September 26, a move which prompted the establishment to appoint him as Britain’s Secretary of State for Business, Enterprise and Regulatory Reform to appease Beijing. Alas, it was a short future indeed for Lord Mandelson since it lasted only 9 days before he was rushed to the hospital. At least 56,000 Chinese babies needed treatment for kidney stones and 4 died [we may never know the exact number of the dead, a state secret] when Chinese companies added melamine, an industrial chemical, to make watered-down milk appear nutritious and used the tainted milk to manufacture infant formula. The worst contamination case involved infant formula manufactured by a joint venture operation owned by China’s Sanlu and New Zealand’s Fonterra. To NZ PM Clark: Confirm or Deny! Tell the Truth to the Parents of the Dead and Sick Chinese Babies, they are Humans, Too! New Zealand Prime Minister Helen Clark claims her government learned of the contamination problem on September 5. She slept over it for three days and then decided to inform Beijing after local Chinese officials refused to act. She deputized New Zealand ambassador to China Tony Brown to tell the Chinese government. Fonterra had “been trying for weeks to get official recall and the local authorities in China would not do it”, Clark told TVNZ. “I think the first inclination was to try and put a towel over it and deal with it without an official recall,” she said. What a load of old codswallop! Do you confirm or deny, preferably under oath, that your senior SIS agent in China, “Y,” told you about the tainted Sanlu powdered milk incident before September 5, 2008? And you better think real hard before you answer the question. And the penetration of mega-markets in nations from China to Mexico with supply and distribution chains that gird the globe — like Wal-Mart, Carrefour and Tesco — has accelerated the trend.